How are the Questions Classified? The question paper software comes with strong tagging and filtering systems, which you can use to classify the question papers into various categories on the basis of subject, chapter, topic, class, unit, difficulty level etc. All these filters can be used to conveniently browse through a number of question banks you have created and stored in the library. All the data pertaining to the properties are stored in the built-in database. The actual content including the questions linked to their respective answers are stored in a Question Reference or QR file. Does the Software Support User-defined Filters? Yes. The Question and Answer Software allows you to set your own filters. You can use the Question Bank Panel to rename the existing filters and also define your own filtering properties for conveniently classifying the questions. While you can create and store simple filters based on difficulty level, marking systems, and the type of questions; you can also set nested filters, such as Unit-Chapter-Topic etc. 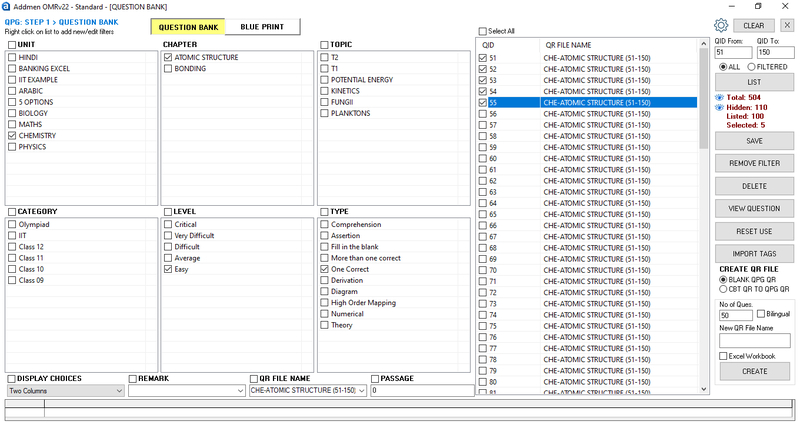 The Question Bank Panel is comprised of a simple interface with separate filter for the various tags currently stored in the software. Each column contains the several tagging categories, and you simply need to put a check mark on the tags to optimally filter your search. While you are at it, you can toggle between the Question Bank Panel and the Blue Print Panel to define the test properties simultaneously.